Northwest Coast Presbytery Community Blessings Grant. 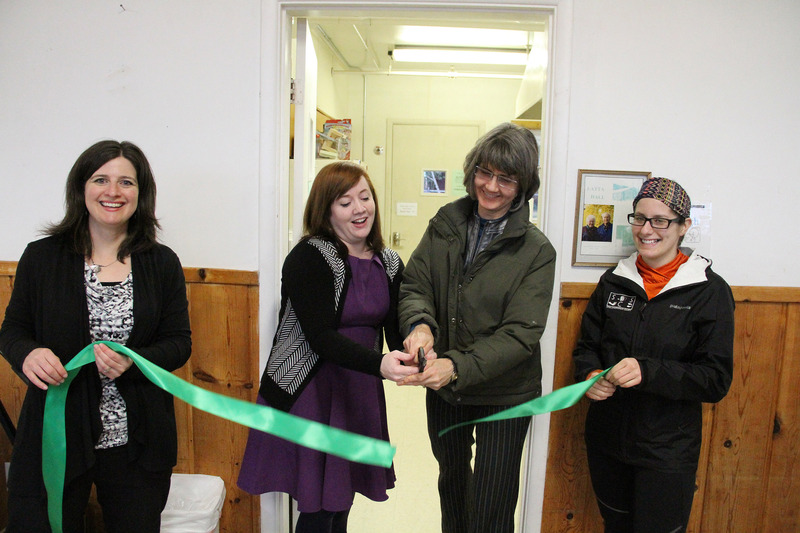 On Monday, March 9, a couple of dozen people attended a ribbon-cutting ceremony for the new Sitka Kitch community commercial kitchen, located at Sitka First Presbyterian Church (505 Sawmill Creek Road). 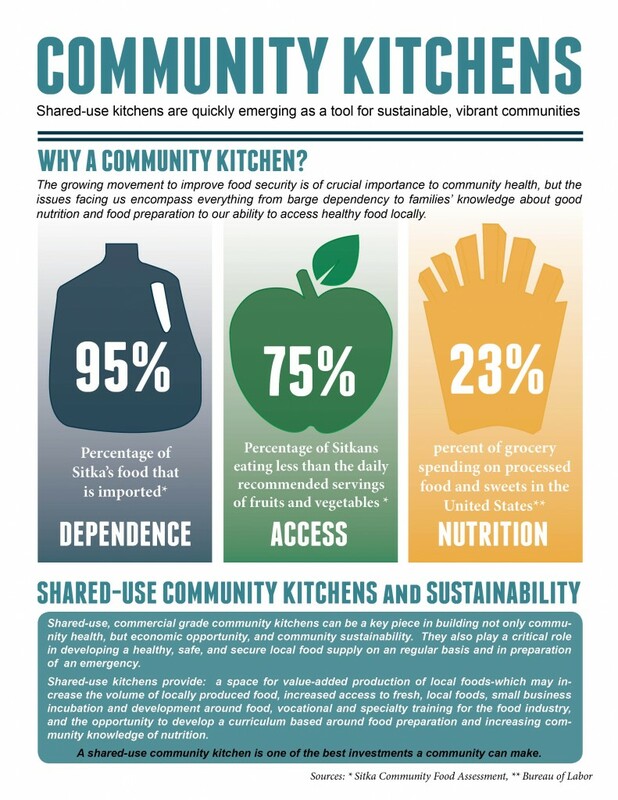 The new community commercial kitchen came out of a food security project from the 2013 Sitka Health Summit. Sitka residents decided a community kitchen would serve several functions as a place to teach cooking and nutrition classes, a place to teach food preservation classes, a place for small cottage food businesses to have access to a rental commercial kitchen, etc. It is a place for education, business incubation, and community cultivation about food in Sitka. The Sitka Kitch project (note, new website for scheduling) is a partnership between the Sitka Conservation Society, Sitka First Presbyterian Church, Sitka Local Foods Network, Sitka Food Co-op, Sitka Health Summit, Sustainable Southeast Partnership, and the University of Alaska Fairbanks Cooperative Extension Service (Sitka District Office). The kitchen recently was renovated after the church received a $13,000 community blessings grant from the Northwest Coast Presbytery. During the ribbon-cutting ceremony, Marjorie Hennessy of the Sitka Conservation Society and Sustainable Southeast Partnership discussed the history of the project and some of its goals. Then she and Cyndy Gibson, representing Sitka First Presbyterian Church, cut the ribbon. Please check out the linked brochure for the current rental rates, which are tiered depending upon the planned use of the facility. This kitchen does meet Alaska Department of Environmental Conservation commercial kitchen food safety standards, but renters are required to get all of their other required permits (business license, food-handling permits, etc.) before renting the kitchen. Groups that already regularly use the facility for deliveries, such as the Sitka Food Co-op and Everything Organic Sitka, will continue to use the facility. For more information about Sitka Kitch rentals, check the website, contact sitkakitch@sitkawild.org or call the Sitka Conservation Society at 747-7509. Eventually the management will switch over to the church. A slideshow is posted below the brochure with photos from the ribbon-cutting ceremony. The Sitka First Presbyterian Church and the Sitka Conservation Society are pleased to announce the official opening of the Sitka Kitch, a new community commercial kitchen for Sitka. Please join us to commemorate this exciting event. A ribbon-cutting ceremony will be held at 6 p.m. on Monday, March 9, at the Sitka Kitch, in the First Presbyterian Church, 505 Sawmill Creek Road. Light refreshments courtesy of the Back Door Café will be served. Sitka Kitch is a community initiative that arose from the 2013 Sitka Health Summit, and is a truly collaborative and partner-rich project. The Sitka Conservation Society, First Presbyterian Church, Sitka Local Foods Network, Sitka Food Co-op, Sitka District Office of the University of Alaska Fairbanks Cooperative Extension Service, and the Sustainable Southeast Partnership have all contributed to turn Sitka’s dream of a community kitchen into reality. Sitka Kitch received $13,000 from the Northwest Coast Presbytery Community Blessings Grant. 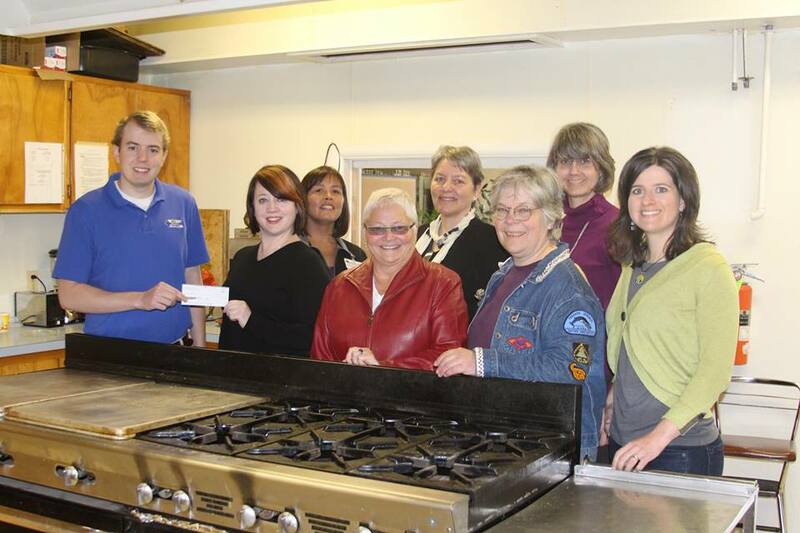 These funds went directly towards renovating the church’s kitchen so that ‘Sitka Kitch’ could meet the requirements of becoming an Alaska Department of Environmental Conservation (DEC)-certified commercial kitchen. The Sitka Kitch now is ready to function as a shared-use community kitchen. Our goal is to provide food-based education, at various levels, to the greater Sitka community. With these renovations completed, the Kitch can offer a DEC-certified commercial kitchen to local entrepreneurs and small businesses for an affordable hourly rate. Instructors interested in developing and offering food-based classes may also rent the kitchen and space. The Kitch also hopes to develop and provide career and technical training, and community canning events. Through multi-use access to a commercial kitchen, Sitka Kitch’s goals are to support a sustainable local foods culture, spark local foods entrepreneurship and empower the community to become more independent and food secure. This will continue to be the delivery location for the Sitka Food Co-op and Everything Organic Sitka. Sitka Farmers Market and other cottage food industry vendors who need to process food products in a commercial kitchen now will have a place they can rent. For more information on using Sitka Kitch, please contact sitkakitch@sitkawild.org.